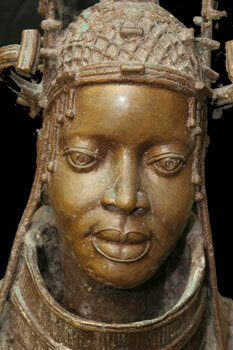 During the 16th century, the Ijebu kingdom (1500-1750) dominated Nigeria’s coastal region. Portuguese copper was traded and the Ijebu cast brass objects that demonstrated an influence derived from the Benin kingdom. 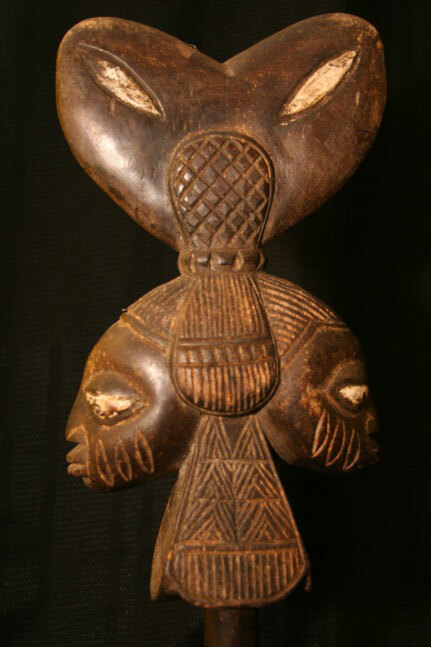 However their bracelets, bells, and office staffs were usually decorated with half human/half-animal figures with globular eyes and often curved forehead scarifications. During the nineteenth century the Ijebu controlled the trading lanes between Lagos and Ibadan. They refused to cede control to the British, and in 1892 the British launched attacks, and incursions on Ijebuland, using Maxim guns, and burning villages. Ijebu Yoruba living along the coast celebrate water spirits with an elaborate program of masquerades called Agbo. They adapted Agbo from the Ijo of the Niger Delta, who are famous for their Ekine masquerades in honor of the ‘water people’, (owu), spirits that “own “ portions of creeks, controlling their water level, currents, waves, and the depth of fish shoals. One distinctive headdress is known as the Igodo. 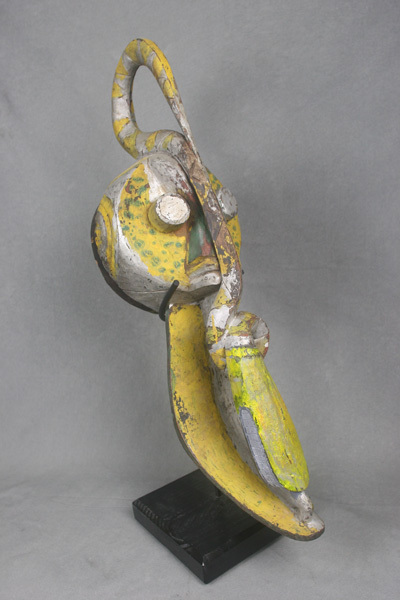 The shape of Igodo masks plays on the form of a paddle and on that of a boat’s prow, evoking the closeness between water-oriented people and spirits of the deep. Two creatures used from Ijo mythology are the python, (the mythic progenitor of all water spirits), and the fishing eagle (ogolo), which carries messages from the water spirits to humans. The Ijebu people are commonly assumed to be stingy people. Ijebus are very rich and successful, more so than most other Yoruba tribes, but along with this they are also popularily deemed extremely miserly with their wealth. Hence ‘Ijebu’ is a popular slang used to refer to any one miserly with money or other resource. Prior to British rule, the Ijebu tribe of the Yoruba race was divided into two branches, known respectively as the Ijebu Ode and the Ijebu Remon. The Ode branch of the tribe is ruled by a chief who bears the title of Awujale and is surrounded by a great deal of mystery. The Remon branch of the Ijebu tribe is governed by a chief, who ranks below the Awujale. This subordinate chief used to be killed with ceremony after a rule of three years, but Ulli Beier (cited by Willett) notes that, according to the existing tradition in Ijebu, the kings were put to death after a reign of only seven years.